In my quest for ways to have fresh greens to eat during the cold months of the year, I have been experimenting with sprouts. From one point of view, you could say homegrown sprouts are about the most local food you can have. After all, you can’t get more local than your kitchen counter. On the other hand, I am not sure where the seeds I have sprouted came from originally, but I doubt it was anywhere near here. Still, by making my own sprouts, I have avoided the unsustainable practice of transporting fresh produce over long distances. Seeds are a lot easier to move from place to place. I bought some sprouting seeds from the bulk foods department of my local co-op. 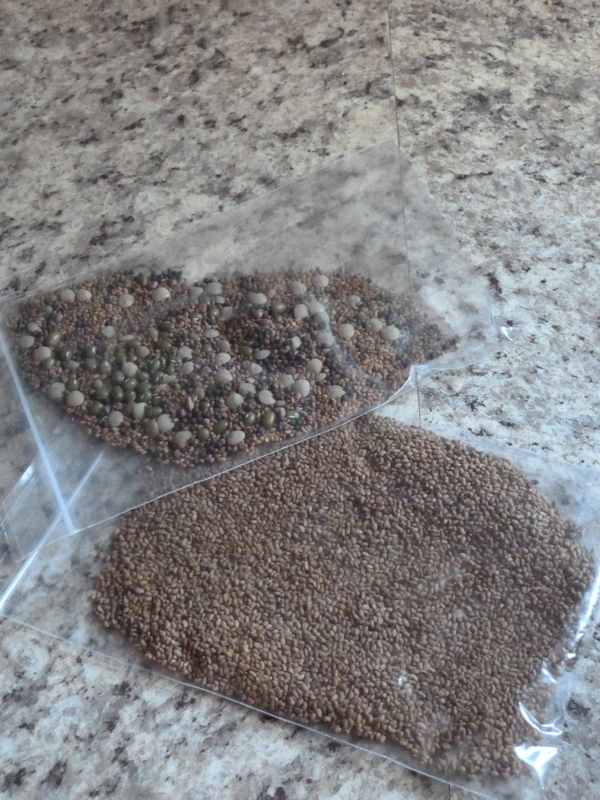 I got two kinds: 1) 100% alfalfa seeds and 2) something called “salad mix,” which contains alfalfa, lentils, broccoli, radish, and maybe a few other kinds of seeds. I use a quart-sized mason jar as my sprouting jar, stretch a piece of a knee-high over the mouth, and hold it down with the jar’s metal screw band. I’m sure a rubber band would work just as well. Two tablespoons of seeds seems to be the right amount for a quart jar. Soak the seeds over night. The next morning, pour out the water, rinse the seeds with fresh water, then let them sit on the counter. Rinse them morning and night for 4-5 days, until the sprouts fill the jar. It’s a good idea to let the sprouts sit in sunlight during the last day or so so they can start turning green. 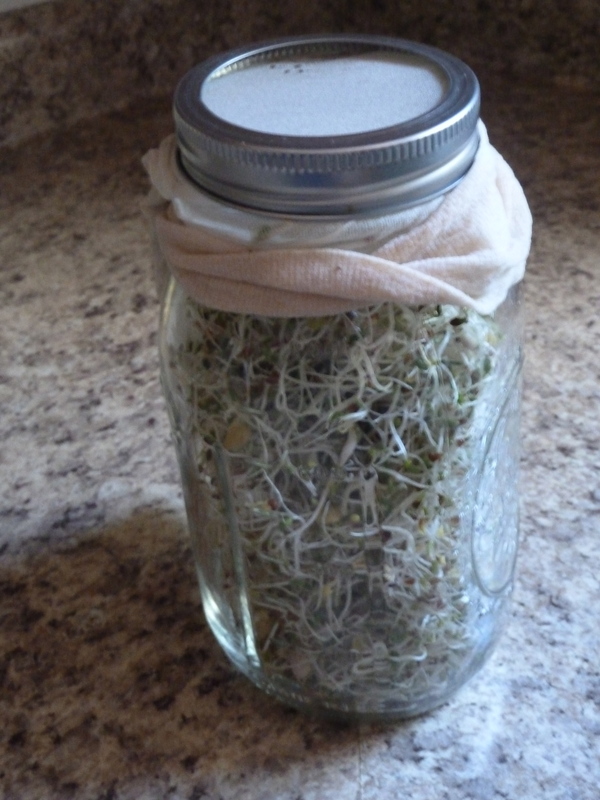 When your jar is filled with green sprouts, refrigerate and enjoy. I mostly eat them in sandwiches with homemade hummus, or in salads. They’re great in omelets, too. This entry was posted in Uncategorized and tagged salad, sprouts. Bookmark the permalink.